Barataria Bay• Location: Barataria bay located in Louisiana between Bayou Lafourche to the west and theMississippi river. The system is separated from the golf of Mexico, but serves as theprimary connecting to the open gulf water. 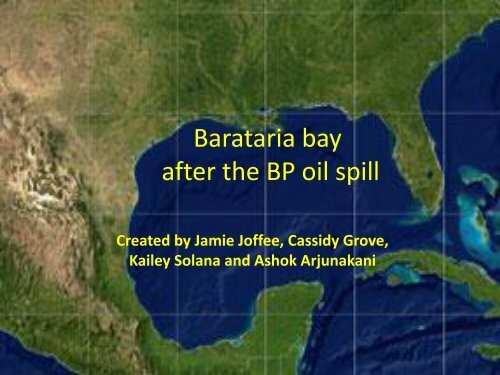 The bay characterized as a nursery andbreeding ground for migrating birds and variety of recreational and important species likealligators , shellfish , finfish, song birds, ducks and geese.• Problem: the BP oil spill was the biggest is us history, meaning the after affects from itmay not be seem until many years after. This is a problem because scientists andresearchers wont or don’t know exactly how bad the oil spill affected the wild life on theGulf coast and especially in Barataria Bay.• Ecological impact: an estimate of deaths from the spill was about 6,165 sea turtles, 82,000birds of 102 species and as many as 25,900 marine mammals, including four species ofdolphins and whales. Amount of oil spilled in the Gulf coast was 4.9 million barrels of oil,about half the amount of crude oil the U.S. imports per dayCaption: to left Pelican eggs stained with oil sitin a nest on an island in Barataria Bay .The on next to is oil from the DeepwaterHorizon spill pools against the Louisiana coastalong Barataria Bay.